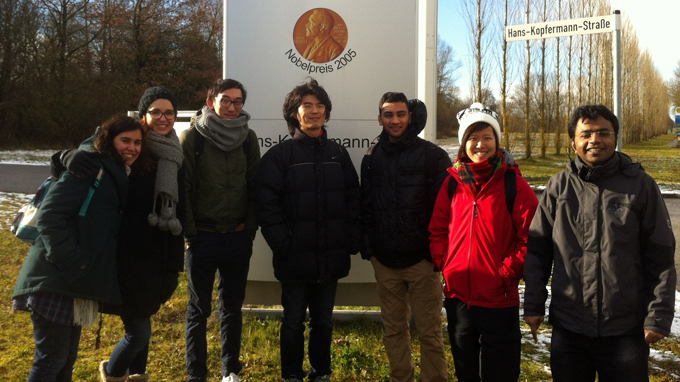 All about studying at the TUM and living in Munich for international degree students. This goes from the selection of courses, learning German and the administrative as well as practical support from other TUM students to housing search, excursions and cultural program. International students during a campus tour. The prerequisites and regulations for international degree students are the same as for any other regular student, but they receive extra support from us! Please check our site for applicants to find out more about the prerequisites and deadlines. If you come from overseas, please consider that you will only be able to obtain your visa on time to come to Germany if you submit all your application documents well in advance the deadline. Furthermore, only students completing their enrollment on time are able to register for language courses (these fill up very quickly!) and obtain their student card early enough to gain access to all student services: public transportation, cafeteria, library, internet, sports, etc. Our Physics Department offers one Bachelor's degree program, four Master's degree programs and a number of opportunities to conduct your doctoral studies. The adequate program for you will depend on your previous academic qualifications, your scientific interests and your language proficiency. If you are planning on doing your Master studies at TUM, you should have a look at our specialization courses (so-called special courses) and see that your interests are covered within the Master program you would like to apply for. Please be aware that the general courses and special courses catalogs contain current as well as past courses, which might not be offered any longer. Information and advice on part-time jobs during your studies is given by the German national agency for internationalization of higher education (DAAD). Although there are no tuition fees in Germany and only a small student union fee is applicable, do not conclude from this that studying in Germany is cheap. Assess well the resources at your disposal and look for qualified advice at the TUM Student Service Center and your nearest DAAD office. If you would like to take a student job to support yourself during your studies or experience the job market through an internship, there are several possibilities on Campus Garching and in Munich. However, we do not recommend you to start working during the first semester of your studies, as there are several things you will have to adapt to during that time. In terms of research, you could take a student job e.g. either in a group of the Physics Department or at one of the Max Planck Institutes. Please have a look at the TUM black board or contact personally the professors in each institution. For advice on internships in the industry sector, do refer to the carefully selected information and contacts from the TUM Career Service. International students who do not come from the EU or European Economic Area are in general only allowed to work 120 full or 240 half days in a year. International students who do not come from the EU cannot go self employed or work freelance! The TUM Language Center offers during the semester German language courses. International degree students are welcome to join, but do register well in advance in order to secure a place. The courses are free of charge, but they fill up very quickly!!! Check also their intensive language courses taking place during the semester breaks and if you have the opportunity, do not miss visiting a beginners German course in your home country before coming to Germany! Since 2015, the TUM Language Center offers a special program for international Master students: German matters. Within three semesters, complete beginners can reach an intermediate level in German, gain intercultural competence and participate in a fit for the job seminar. Solid German language skills facilitate your integration into the local social life and are key for a future career in or in connection with Germany, either in the industry sector or in academia. The program is free of charge and the number of places is limited, it has been designed avoiding interference with lectures or exam periods and allowing for internships and part-time jobs during the lecture free period. Application deadline for the winter semester is August 31. Are you looking for hands-on experience that can help you in your future career? Do you want to give something back? Our students are highly involved in the student union (Fachschaft) and as student representatives on the faculty council and appointment commissions. They also contribute to the design of teaching and course contents. In addition, many extracurricular initiatives are run entirely by students or rely on their engagement and energy. Model United Nations TUM - MUNTUM e.V. To find appropriate accommodation in Munich can be very difficult, especially in October when the semester begins, and planning well in advance is insdispensable!!! The TUM Housing Search Assistance offers helpful tips and links to find accommodation (see their accommodation site for degree students) and has published a booklet Finding a new home in Munich (PDF, 1,2 MB) containing the most important information you need to have when looking for a place to live. The Student Union Munich also offers information and advice on accommodation, finances and cultural life, including psychotherapeutic and psychosocial counselling as well as a protection service against sexual abuse and discrimination. TUM international (TUMi) offers orientation weeks before the beginning of academic activities and regular meetings throughout the year. They also support you in administrative affairs (residence permit, enrollment, public transport, etc.) and offer you a cultural program to get to know Munich and its surrondings. Remember to register well in advance for the activities to ensure you a place! They gladly offer individual advice, in person or via telephone. For additional information on the SSZ and contacts check the main TUM website. TUMinternational provides help as well as a cultural program at the beginning and during academic studies in Munich. It takes aim at international exchange and fulltime students at TUM. There is more to life at TUM than lectures and exams. Our students organize festivals, get involved in student bodies, join music clubs or set up creative research projects. At university students are expected to be highly motivated, to take responsibility for their own learning and to organize their resources and time efficiently. However, fulfilling all of these expectations can be difficult, especially when crucial study skills are not at hand. In order to give you the necessary equipment to master all kinds of studying situations at university, we support you with workshops, consultations hours, online material and an annual event, the "Study Skills Day". Successful graduation at a German university opens a range of opportunities in the German job market for international graduates. What is my best method of attack?